The Notorious Meddler: Witnessing A Debate Between Ark Encounter creator Ken Ham and Bill Nye, the Science Guy"
Witnessing A Debate Between Ark Encounter creator Ken Ham and Bill Nye, the Science Guy"
A second unscheduled "debate" between Ken Ham, who built the new Ark Encounter at Williamstown, Kentucky, and Bill Nye "the Science Guy," best known as the host of a children's science show that ran on PBS from 1993 to 1998, occurred this past Friday, July 8, 2015 in front of hundreds of people, including myself and others from Clear Fork Baptist Church in Albany, Kentucky at the Ark Encounter. The first one occurred at Ham's previous project, the Creation Museum in Petersburg, Kentucky, seven miles west of the Cincinnati Airport, in November of 2014. 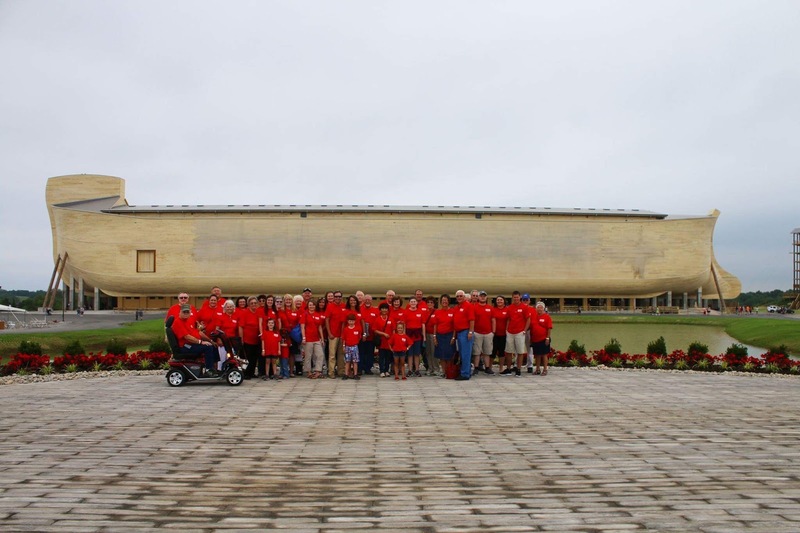 The Ark is part of a ministry that teaches Old Testament stories as true historical events. 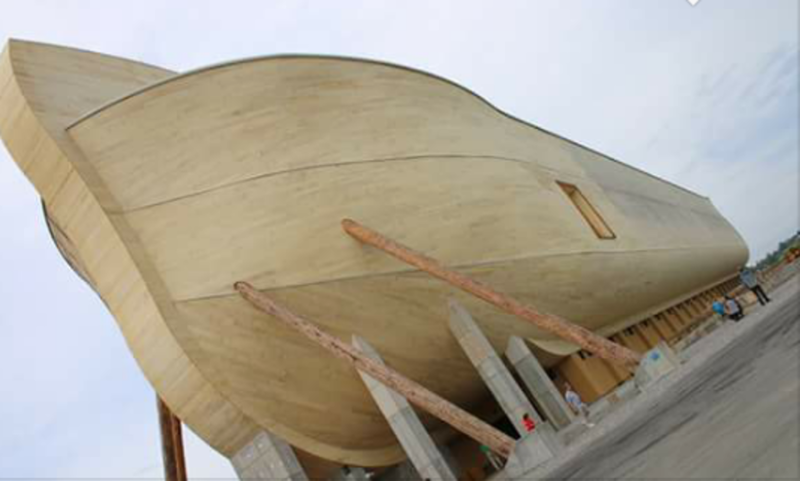 Nye had previously called the ark "a danger to the nation's science education" and had said he hoped it would never be built, because it would "indoctrinate children into this extraordinary and outlandish, unscientific point of view." The ark opened to the public last Thursday, July 7, 2016. 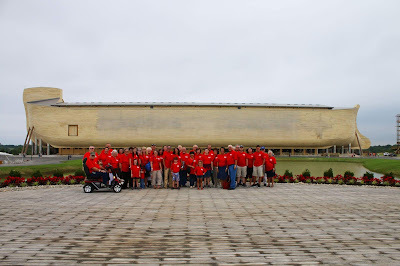 A few weeks ago, Ham had publicly invited Nye to tour the life-size Ark that opened July 7, and offered to personally show him through. Nye accepted. Apparently Bill is the host of an upcoming science documentary and wanted to bring along a video crew as they walked through the Ark. It really turned into an almost 2 hour debate as they walked through all three decks of the Ark. Both Ham and Nye agreed to video the entire discussion as they walked. Numerous children, teens and adults swarmed around them as they passionately interacted as the audience grew. Like the previous day, which was opening day, there were thousands of visitors at the Ark Encounter on Friday and a large group of them had a unique opportunity they will never forget. Nye challenged Ham about the content of many of the exhibits, and Ham challenged Nye about what he claimed and what he believed. It was a clash of world views. At one point Ham asked Nye: what would happen to you when you die? He said when you die "you're done." Ham then asked Nye why he was concerned about what is being taught at the Ark if when we die we're "done." The Ark Encounter is four levels, including the ground floor. The exchange between Ham and Nye moved from level to level. It began on the third level where, coincidentally, a few from my church group were at. Three of us stumbled upon the exchange minutes after it began and quickly notified others via cell phone to come watch. As you can see in the above photo, which I took, myself and two others in my group stood within arms reach of Nye and Ham and we were able to both photograph and record what we saw and heard. You can see photos on my Facebook page. We couldn't believe our ears when Nye told Ham that it's "not crazy to believe we descended from Martians." Ham responded by asking Nye if it was "crazy to believe we descended from Adam and Eve!" The interaction between Ham, Nye and the crowd lasted two hours. Young people also came up and spoke with Nye and asked him questions, and challenged him. Specifically, we witnessed an exchange between Nye and a young lady from Iowa. One member of our group even asked Nye a couple of questions. Ham is also the founder of Answers in Genesis, an apologetics ministry dedicated to helping Christians defend their faith and proclaim the gospel of Jesus Christ. When Ham mentioned AiG's PhD scientists, Nye said they were all incompetent, so Ham encouraged Nye to speak with them. Ham had opportunity to share the gospel with Nye a number of times as they strolled through the Ark. As they made their way through the first floor in front of life-size models of Noah and his family who were depicted praying, Ham asked Nye if he would mind if he prayed, and could he pray for him. Nye responded that Ham could do whatever he wanted, that he couldn't stop him. 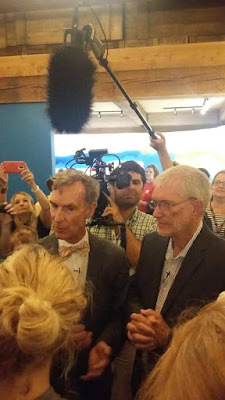 So while a large group of people were gathered around, Creation Museum and Ark Encounter creator, Ken Ham, publicly prayed for Bill Nye, the Science Guy. Ham asked Nye if they could be friends. Nye replied that they could be acquaintances with mutual respect, but not friends. Ham later wrote that he never expected their meeting would turn into a two hour debate, but he said sometimes those spontaneous happenings can be very fruitful and exciting. Ham said it was so fitting that with the opening of the Ark Encounter, this massive ship is being used to witness to such a well known personality. The meeting between Ham and Nye ended with a friendly handshake. For more information on the Ark Encounter, a world-class themed attraction that is now open to the public, go to arkencounter.com. I highly recommend it. Love the article, loved the experience!!! About the article, you are welcome. I did not notice Cheryl until after I had already looked at the photo a few times. Yes, a great trip!